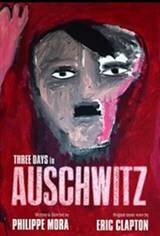 Co-produced by award-winning director Philippe Mora and music legend Eric Clapton, Three Days in Auschwitz details life and death in a concentration camp. As a Jew born in 1949, Mora is a second-generation holocaust survivor who lost eight members of his family at Auschwitz. After discovering his father was in the French Resistance and his mother evaded Auschwitz by one day, Mora makes three visits to Auschwitz between 2010 and 2014 in an effort to understand and pay homage to the plight of the Jews during the Nazi regime.